In a separate pot, boil about 6 quarts of water. 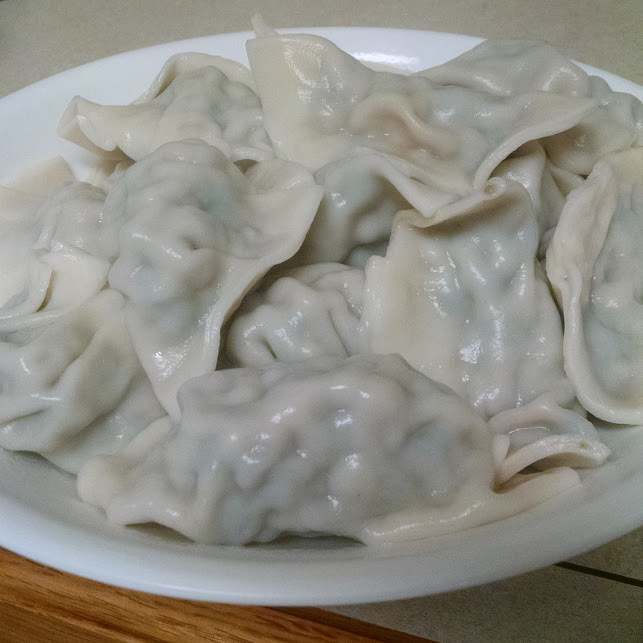 When water start to boil, carefully place the dumplings into the water as you lightly stir the water. Bring to boil again. This time add 1 cup of cold water and bring to boil again. Dumplings would be ready when they float to the top. Bon Apetite! Also goes with dipping sauce. Prepare customize dipping sauces with soy sauce, sesame oil, chili sauce, vinegar and etc. Heat a cup of cooking oil to 375 degree. ( place a slice of ginger in the oil and wait til it simmers). Place the dumplings in and fry til golden brown. Drain on paper towel and serve. The extra spinach and spinach juice can be used for egg drop soup. wow I tried this recipe and the results were delicious! I only used vinegar for my dipping sauce but that was just enough to enhance the already great flavor of the dumplings. thanks for posting- looking forward to your other recipes!